With the M-Track 2X2M, you can create 24-bit/192kHz studio-quality recordings with an intuitive and easy-to-use audio interface. This article walks through a number of frequently asked questions about the M-Track 2X2M. How do I connect the M-Track 2X2M to my computer? Do I need a driver to use the M-Track 2X2M? What sample rates does the M-Track 2X2M support? What is the difference between the M-Track 2X2 and the M-Track 2X2M? I connected to input 1 on the front and input 1 on the rear but I only hear the front input. Is this normal? The M-Track 2X2M comes with a USB-C to USB-C cable as well as a USB-C to USB-A cable to ensure that it can connect to all current and future available USB connections available. There is no difference in the audio quality between the USB-A, B, or C connections. The M-Audio M-Track 2X2M simply uses the USB-C connection because it is becoming the industry standard USB connection type. The M-Track 2X2M is USB hub-powered meaning that it is powered simply by connecting it to your computer with the included USB cable. No additional power connections are necessary. For a Windows operating system, the M-Track 2X2M requires the installation of drivers to ensure the best possible performance. For Mac operating systems, the M-Track 2X2 is class-compliant and does not require a driver installation. The M-Track 2X2M supports up to 24-bit and 192kHz studio quality sample rates to capture every nuance and subtlety of your performance. Next, in your preferred Digital Audio Workstation, set the track that you are attempting to play/record into to channel 2. Most DAWs default to channel 1 and the instrument channel on the M-Track 2X2M is set to send on channel 2. The M-Track 2X2M weighs about 2 pounds and the dimensions are approximately 8" x 6" x 2.75" (L x W x H). 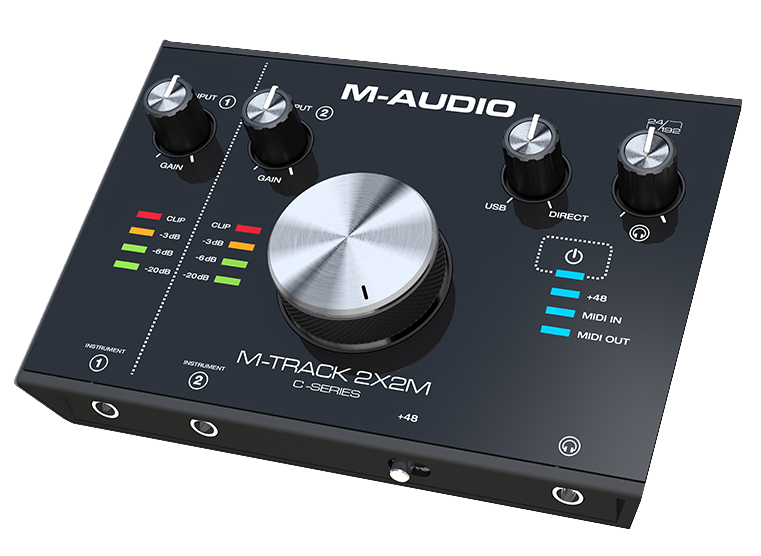 The main difference between the M-Track 2X2 and the M-Track 2X2M is that the M-Track 2X2M features a 5-pin DIN MIDI input and output along with the high-quality audio inputs and outputs. For both inputs 1 and 2, the priority is the front input. If connecting to both the front and rear inputs on the same channel, only the front input will pass through.